Stems 2--5 mm diam. ; hairs reddish brown to chestnut brown, falling off early. Leaves to more than 1 m, axes straw-colored, glabrous except at petiole base. Penultimate segments sessile, divergent to ascending, in ± equal pairs, deeply pinnatisect, lanceolate to oblanceolate, to 30 × 6 cm wide, leathery, glabrous, whitish waxy or glaucous abaxially. Ultimate segments linear, slightly dilated proximally, margins strongly revolute, apex retuse. Sori nearer midrib than margin; sporangia usually 6--12 per sorus. Terrestrial and climbing on open slopes in drainage ditches; widespread, tropical; 0 m; Ala., Fla.; Mexico; Central America; South America. Plants in Florida tend to be depauperate when compared to tropical populations; individual leaves are smaller and plants seldom form dense thickets. 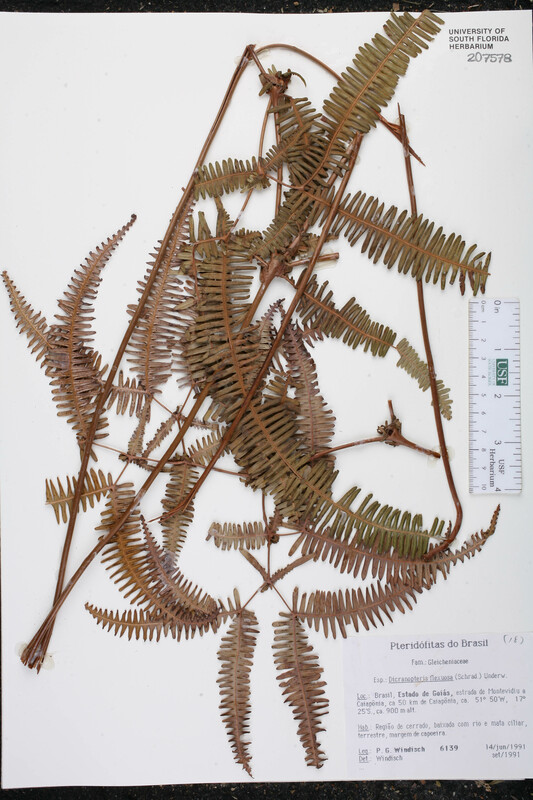 Dicranopteris flexuosa appears to be a natural element in the flora (J. R. Burkhalter 1985; R. Moyroud and C. E. Nauman 1989). 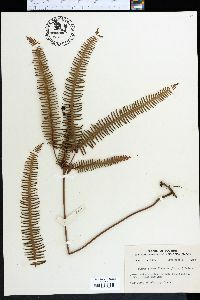 Plants may not persist very long, however, as evidenced by Alabama and some Florida populations that are no longer extant.